These Global Traveller Shirts from White Rock are made from totally natural fibre - 65% Bamboo and 35% Cotton. They are wonderfully soft and look great as well as being uniquely designed for travelling. Bamboo fabric absorbs and evaporates moisture quickly and efficiently and is incredibly breathable, so the Global Traveller Shirts will keep you cool, dry and comfortable. Fabric made from bamboo is also anti-bacterial and anti-fungal, helping these shirts stay fresher and odour free for longer - ideal for airports, hot and humid climates and everyday use. 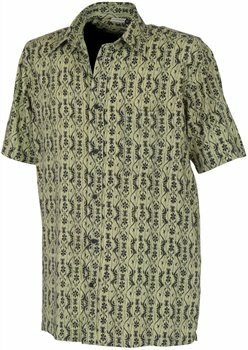 Bamboo shirts are also ideal for anyone who suffers from sensitive skin or allergies, and its anti-static properties mean that the fabric does not cling to your skin. Manufactured to give superior sun protection - SPF30 /UPF50 - the Global Traveller Shirts have a tight weave construction to help protect from harmful UV radiation, and each shirt has an integral zipped inside security pocket designed for passport and paper money storage. This was bought as a gift and the recipient has reported back that he is thrilled with the shirt, the fit is perfect and he is looking forward to travelling with it. I like these shirts so much, especially at the low prices I've paid, that I've bought about a dozen of them. Very comfortable. Good product, great value, delivered on time, would buy again.